Save $2,000 per couple off this cruise. Click here for eligible departures. Past guests of Uniworld, Trafalgar, CostSaver, Insight, Luxury Gold, African Travel, Brendan and Contiki save an additional $300 per person off this trip. Click here for eligible departures. Single supplement is waived or reduced on this cruise. Click here for eligible departures. Receive free unlimited alcoholic and non-alcoholic beverages, as well as free prepaid gratuities for onboard and onshore services, on any Europe river cruise. Click here for eligible departures. If Russia is “a riddle, wrapped in a mystery, inside an enigma” as Winston Churchill famously said, then Moscow presents an intriguing starting point for an amazing cultural discovery. Credit for Yaroslavl’s well-designed, UNESCO-protected city center goes to none other than Catherine the Great, who was even more than a mighty Russian ruler—she was a forward-thinking urban planner as well. Visit an Orthodox church and a lively market. Beyond Russia’s major cities lies a completely different world—the fabled land of Mother Russia. Explore a rural village today for an authentic and unforgettable glimpse of everyday life in a Russian province. Travel back in time to the 19th century at a reconstructed Russian village populated by talented artisans who make handmade items using traditional materials and techniques. Other highlights today include a rustic shashlik lunch. St. Petersburg is a city of canals, palaces and cathedrals that presents a glorious juxtaposition of East and West. See the sights by land as well as water. Later, spend an evening watching a ballet at the Alexandrinsky Theater, home of the oldest theater company in Russia. Considered one of the architectural jewels of the city, you can see first hand one of the finest works of the great neoclassical architect Carlo Rossi. Cross the threshold of the summer residence of the tsars—the lavishly decorated Catherine Palace—where you’ll see opulent staterooms and the near mythic Amber Room, meticulously restored to its former glory. Marvel at the palace’s immaculate grounds, dubbed Pushkin Park, then spend the rest of the day exploring on your own. Explore the dichotomy of Moscow—rich with monuments to both 15th-century tsars and 20th-century communist leaders. Stand in awe of the massive Kremlin complex, onion-domed St. Basil’s Cathedral and the extravagant Moscow metro system. See some of Russia’s vast and beautiful countryside as well as its delightful small towns, where locals still engage in traditional crafts. Cruise along the Golden Ring to some of Russia’s most beautiful cities, including Uglich and Yaroslavl, which are known for their white-stone churches and gorgeous monasteries. Be amazed by Kizhi Island’s UNESCO-designated Transfiguration Church, a wooden structure built entirely without the use of nails. And uncover regal St. Petersburg, which boasts art-laden galleries and museums, fabled canals and elegant architecture from a wide variety of eras. Who will enjoy this cruise? 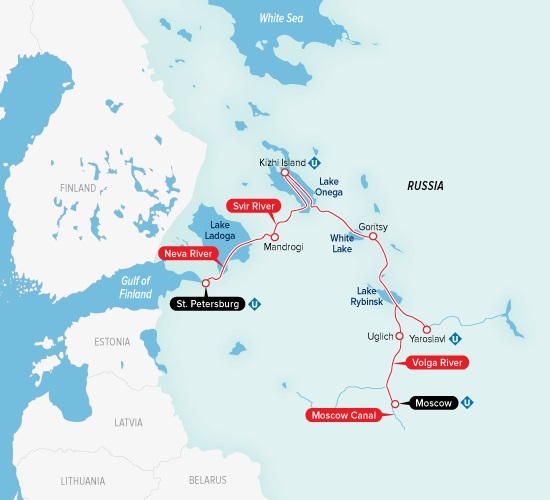 Adventurous travelers who wish to sail Russia’s great rivers and lakes, seeing world-class cities and timeless towns, UNESCO World Heritage sites, stunning architecture and legendary art as they go. Prices exclude additional port charges of $270 per person.